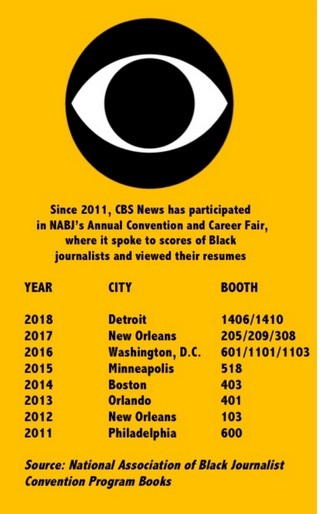 For years, CBS News had booths at the National Association of Black Journalists’ massive annual career fair, where they reviewed hundreds of resumes and spoke to scores of young and experienced Black journalists. The network recently hired 12 reporters and producers to cover the 2020 presidential election season. None were Black. With a highly-skilled Black female as its executive director for Development and Diversity and inclusion, what happened? Interviews were done and the job offer letters were sent out. It was time for CBS News to announce its Class of 2020 reporters and producers who will be covering the presidential election in 2020. So when newly-hired employee Ben Mitchell tweeted his excitement with a photograph of CBS News’ new 2020 digital team of young journalists, Black journalists responded with disgust. They saw that out of 12 new hires, none were Black. An investigation by the Crusader news group has learned that CBS News—one of the nation’s major television news networks— has, for eight consecutive years, featured a booth (s) at the National Association of Black Journalists’ career fair. It is the largest of its kind for Black journalists seeking to advance their skills or get a foot in the door in the competitive world of print and broadcast journalism. With some of their broadcast executives, CBS News, like many media organizations, reviewed resumes and spoke to aspiring Black journalists from all platforms. Out of this massive harvest of applicants, CBS News failed to produce a single Black journalist on its 2020 presidential coverage team that was announced four months after the NABJ career fair in Detroit was held Aug. 1 – 5. In fact, since 2011, CBS News has participated in eight consecutive NABJ career fairs, but has hired only one Black journalist out of at least 22 hires on its 2012, 2016 and 2020 presidential election teams. Most are white, privileged professional journalists working at prestigious media organizations that include CBS, the New York Times and the Washington Post. Fresh out of college, Black journalists who attend the fair gain the opportunity to learn the business and build a reputation and track record that eventually sets them on the path to success. Meanwhile, many Black journalists continue to struggle in advancing their careers. Statistics show that television and print newsrooms across the country still lag in diversity and equal opportunities for people of color. For this story, the Crusader examined LinkedIn and Twitter accounts, photographs, news stories and all of NABJ’s convention programs. The Crusader also spoke to some Black journalists who attended the NABJ’s career fair. “It is unfortunate that we are still having these discussions about diversity and inclusion,” said NABJ president Sarah Glover. CBS News’ response to the criticism is being met with skepticism. How can a major television news network that participates in the largest Black journalism career fair in the country leave out professionals of color on its 12-member, 2020 presidential team. It is a question that has NABJ’s top executives scratching their heads, with veteran Black journalists demanding that CBS News make changes. With access to Black journalism schools, NABJ’s career fair and its informative Twitter thread, many may find CBS News’ latest act hard to believe. For decades, major media organizations have claimed that there are not enough qualified Black journalists and applicants for jobs. For CBS News, there may not be an excuse. In addition to CBS News, past participants have included ABC, NBC, CNN, ESPN, Fox News, the New York Times, the Washington Post, the Los Angeles Times, the Chicago Tribune and the Chicago Sun-Times. Some media outlets purchase multiple booths and merge them to a bigger presence at the career fair, which for many Black journalists, is the most sought-after event. Last year, some 3,000 people attended the NABJ convention and career fair. At next year’s event in Miami, NABJ expects 4,000 people to attend. Despite its size, the career fair remains just a portion of the annual NABJ convention, a heavily- attended affair that’s held in a major city every year. The convention has morphed into an enormous social and professional event for four days. It is stacked with classes, workshops, parties and endless social events. The convention attracts many prominent Black editors, news directors, television anchors and print journalists as well as high-profile celebrities. Months before the event, the host hotel for the convention runs out of rooms. Last year, the convention was held in Detroit. Movie mogul Tyler Perry hosted a sold-out class, and many convention guests viewed a screening of the Oscar-nominated film, “BlacKkKlansman” before they were treated to a question-and-answer session with its Oscar-nominated director, Spike Lee. For many Black journalists, the real action was the career fair, where dozens and dozens media organizations which represented print, television and radio. Yards away from NBC Universal was CBS News’ exhibit, which was created out of two booths. Its royal blue backdrop included photographs of its top journalists, including “60 Minutes’” Oprah Winfrey and her longtime friend, “CBS Morning” anchor Gayle King. For three days, two CBS News representatives sitting at tables spoke to many Black journalists, looked at resumes, answered questions and gave helpful tips on advancing their careers. The network even offered free on-air style consultations by two of its makeup artists. There was also a Black female CBS News producer who posted a video to say that the network was hiring. At the 2017 NABJ Convention and Career Fair in New Orleans, CBS News seemed to have had a bigger exhibition that took up the space of three booths. In 2016, CBS News secured three booths again as it interviewed Black journalists attending the career fair in Washington, D.C.
Before that, CBS News participated in NABJ’s career fairs in Minneapolis, Boston, Orlando and Philadelphia. All those career fairs and CBS News can’t find or hire at least one Black digital journalist to serve on its 2020 presidential election team? There are also questions as to why CBS News did not post the openings on NABJ’s popular Twitter page, where local and national news organizations tweet the latest job openings and Black journalists tweet their latest job offers. To make matters worse, CBS News’ executive director for Diversity and Development is Kimberly Godwin, a highly-skilled Black woman who climbed up the ranks at the network. For its 2016 presidential election team, CBS News did hire one Black journalist out of seven members to cover the bitter battle between Donald Trump and Hillary Clinton. She is Erica Brown, a Howard University alumna. According to Twitter and Muck Rack, Brown is still a digital journalist at CBS. One of her 2016 colleagues, Jacqueline Alemany, 29, is a reporter and early-morning news anchor for the Washington Post. Sopan Deb, another 2016 digital team member from CBS News, is now culture reporter for the New York Times. Two other former colleagues of Brown’s, Kylie Atwood and Alan He are active journalists. He serves as a national security reporter for CNN. Atwood is a congressional correspondent for CBS News. By comparison, for its 2016 presidential election team, ABC News, which also had booths at NABJ’s career fair, hired two Black digital journalists—one male, one female—for its 13-member team. In addition to posting tweets, digital journalists attend rallies, town meetings and state fairs as part of an effort to provide insight into the campaign season. They are usually young and recent college graduates. To cut costs, television networks are turning to young digital journalists who are willing to work for less money to gain experience that will hopefully lead to a job at a major news organization. For the 2020 presidential election season, California Senator Kamala Harris will be among several Blacks running for the White House. CBS News’ colorless digital team is being viewed as a slap in the face to its Black audience. For its 2012 presidential election team, the network hired at least three candidates, according to a story in the New York Times. None are Black, and most were fresh out of college. They had little to no professional journalism experience before they were hired at CBS News. Three have since advanced to greater roles at CBS News. One of them, Fernando Suarez, is a producer based in London. Last January, CBS News fired Chaggaris after allegations of “inappropriate behavior” were brought to light. McGlinchy remains with the network as broadcast producer for “Weekend News,” according to his LinkedIn account. For Black journalists, the best and perhaps greatest path to these jobs is through the NABJ career fair, where they get the opportunity to speak with an employer rather than wait for a response from an emailed resume or posting. But with airline, hotel and convention registration costs, many Black journalists cannot afford to attend the event which can cost at least $1,300, excluding costs for food and personal expenses. Some share hotel rooms while others simply pay the registration fee for the career fair to save money. Others take a gamble to pay big bucks to travel hundreds of miles to attend the career fair, hoping their investment will yield a big job. This reporter paid the career fair registration fee for one struggling Black freelance journalist who was out of a full-time job for two years. For Black journalists, CBS News’ latest debacle makes the job search more painful and difficult. They say the makeup of the CBS News team underscores the unfair advantages white journalists have in landing plumb jobs while their Black counterparts remain shut out of the process. According to a recent survey by the Radio-Television Digital News Association, Blacks account for 11 percent of news staffers in television newsrooms and 10.8 percent are Hispanic or Latino. The survey said diversity in television newsrooms is at an all-time high, but Blacks and minorities still lag far behind their white counterparts, who make up over 75 percent of television newsrooms. Neither responded by press time Wednesday. Minutes before the deadline, Hart emailed the Crusader, asking if this story was still being written. The Crusader told him yes in an emailed response. But the Crusader never back from Hart. During a phone conversation, Hart said CBS News had two Black journalists on its 2016 presidential team and not one as the Crusader originally reported using information from CBS News’ website. In addition to Erica Brown, Hart said Rodney Hawkins was the other Black journalist on the CBS News’ presidential election team. Hawkins’ name was not included on a CBS News graph that shows its seven-member 2016 presidential team. Hart promised to email the Crusader information that would verify Hawkins’ employment with CBS News in 2016. He never did. Hart also asked the Crusader to remove his and Robinson’s name from this story, saying they are both publicists and do not work directly with CBS News. As it turned out, both have CBS News email addresses and their names are on CBS News’ website that lists members of the network’s top executive communications team. Their names will remain in this story because the Crusader accurately reported that the newspaper emailed them seeking information in an genuine effort to write and publish an accurate story. Neither responded for an interview before this story’s 1 p.m. deadline as specified by the Crusader. In his email to the Crusader, Hart said in the last year, 21 percent of CBS News interns were Black and 35 percent of its news associates are Black also. Hart also said that in the last three years, CBS News has hired from the NABJ. With these figures and statements, But Hart did not provide any names of these hires. Hart did point out that Lora Jones is the new Managing Editor for CBS News’ Washington Bureau. That was made known to NABJ after criticism erupted about its colorless 2020 presidential team. CBS News told the NABJ that Jones will oversee “much of the political coverage” during the 2020 presidential campaign season. Victoria M. Walker, a lecturer at Howard University’s John H. Johnson School of Communications said she was “not surprised” by the absence of Black journalists on CBS News’ 2020 presidential team. A former “CBS This Morning” intern and Washington Post staffer, Walker viewed CBS News’ decision as an “oversight” than blatant racism. “Black journalists always get the short end of the stick when it comes to opportunities in major media organizations,” she said. “This really isn’t surprising, but this should not have happened. Walker said having a Black executive for diversity and development at CBS News doesn’t always guarantee that Blacks will have equal opportunities at media organizations.